The Crown Chakra focuses our attention on the spiritual meaning of life and is the centre for our highest spiritual consciousness and personal expression. The Crown Chakra also governs the brain, hypothalamus, nervous system and pituitary glands. The seventh of the seven main Chakras is the Crown Chakra. Located on the top of the head and connected with the Pineal Gland, this Chakra when balanced, carries the consciousness of pure awareness connecting us with Source. It opens us to the greater world beyond material existence and connects us with the timeless space of all knowing. The symbol of the lotus flower has always been related to this Chakra and to the state of enlightenment that we can achieve through reaching this level of consciousness. Relates to: Violet, Pure Awareness, Spiritual Connection and the Integrated Spiritual Body. 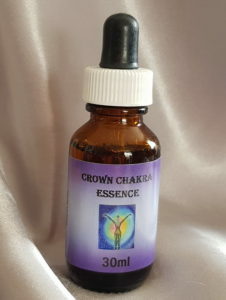 This is the final essence in the Chakra Essences Range.